Hard to believe it, but Customs for the Kid has been blogging about the Star Wars custom action figure community for 5 years this week! All month long, Customs for the Kid were trying to come up with an epic custom action figure reveal for this milestone. Then at the last minute, a decision was made to totally change course. Instead of focusing on some new action figure that we'll all forget about later in the week, they decided to focus on what they're celebrating, their best custom of all...the blog. Customs for the Kid never thought that this endeavor would have lasted as long as it has. When Elias decided he wanted to start making his own Star Wars custom action figures at the early age of six, I thought it was only going to last a few weeks at most. I still remember sitting at my laptop typing in my newly created moniker, Darth Daddy, as I set up an account to post Customs for the Kid's first custom action figures over in the Yakface forums, not knowing that one day, this persona would develop into an alter ego that would later receive almost a million views a month on the Darth Daddy Google+ profile. 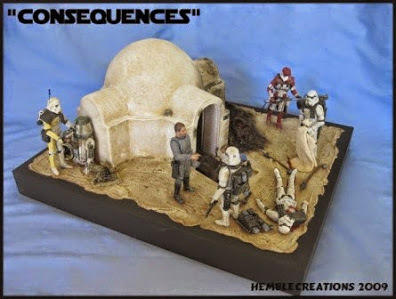 When Customs for the Kid started their customizing journey, they were amateurs, who to their surprise, went on to create one of the most popular resources for Star Wars custom action figure art on the web today! If someone told me that this little boy's passion and persistence for creating his own toys would have manifested into a blog read in over 120 countries around the world, I wouldn't have believed them. The blog's success and popularity has been the result of an actively participating community of artists. Customs for the Kid has become a place where artists, collectors, and fans of the artform can find new talent, customizing techniques, action figure parts lists, collector focused fundraising campaigns with unique incentives, video tutorials, photonovels, and stop motion videos. Customs for the Kid also takes the time to promote issues like the Legion of Leia initiative. 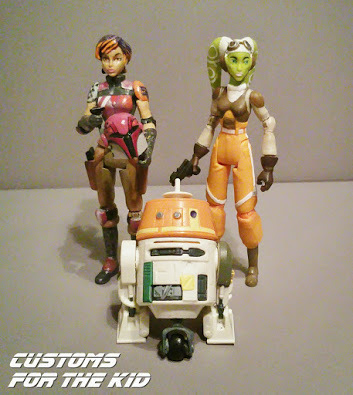 Customs for the Kid has long been championing the demand for an increased female character presence in the Star Wars toy lines on their "Customs for the Fangirls" page. Customs for the Kid were really honored when the Fangirls Going Rogue podcast acknowledged our efforts. Looking at how the blog has grown from its humble beginnings, Customs for the Kid are completely amazed by all that they have accomplished since they started on this long adventure. With hundreds of custom action figures created by their hands, they saw an activity that they engaged in at the kitchen table grow to epic proportions. All of their dedication paid off earlier this year when their blog caught the attention of Disney and Lucasfilm who featured Customs for the Kid amongst the most talented and respected custom action figure artists in the world today at Star Wars Celebration Anaheim in their Star Wars Custom Action Figure Panel hosted by Star Wars customizing artist Sillof. As customizers it was the highest honor they could have ever hoped to achieve. It was even cooler than when Custom Action Figure News mentioned their "Mother Talzin" custom action figure for "Custom Action Figure of the Year" in 2013, or when they won the "Grand Prize" in Yakfinities #50 in a tie with Star Wars customizer, Sjefke last year. Even though being acknowledged for one's efforts can be very rewarding, one of the coolest perks of writing the blog was the relationships in the community that they'd developed. About a month ago Customs for the Kid had the opportunity to create some of the promotional art for the fanrock band High Adventure's upcoming full-length album release "High Five". I was personally really grateful for getting the opportunity to take a staff position over at The Star Wars Underworld writing the "Darth Daddy's Customizing Corner" column which provides the customizing community with a platform to expand the world of Star Wars customs outside of the web forums and have a presence alongside other popular Star Wars topics being floated in the newstream. It was really cool to see the artform receive such strong support from a well known Star Wars fan site. Customs for the Kid had a blast appearing as guests on The Wolfpack Podcast's Clone Wars tribute episode that is still remembered among Star Wars fans for its legendary length. Customs for the Kid haven't had many custom action figure contests on the blog, but the contests with RebelForce Radio were loads of fun and they still can't believe the list of cool judges for the events. Their current "Smuggler's Bounty" contest is running now so be sure to enter! 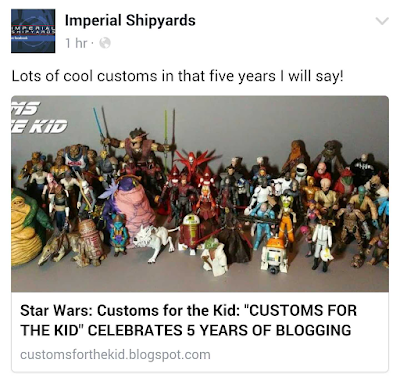 It can't go without saying that Customs for the Kid wishes to express their sincerest gratitude to all the Star Wars fan sites like The Star Wars Underworld, Yakface.com, Jedi News, Jedi Temple Archives, Imperial Shipyards and Jedi Business for featuring their custom action figures over the years. 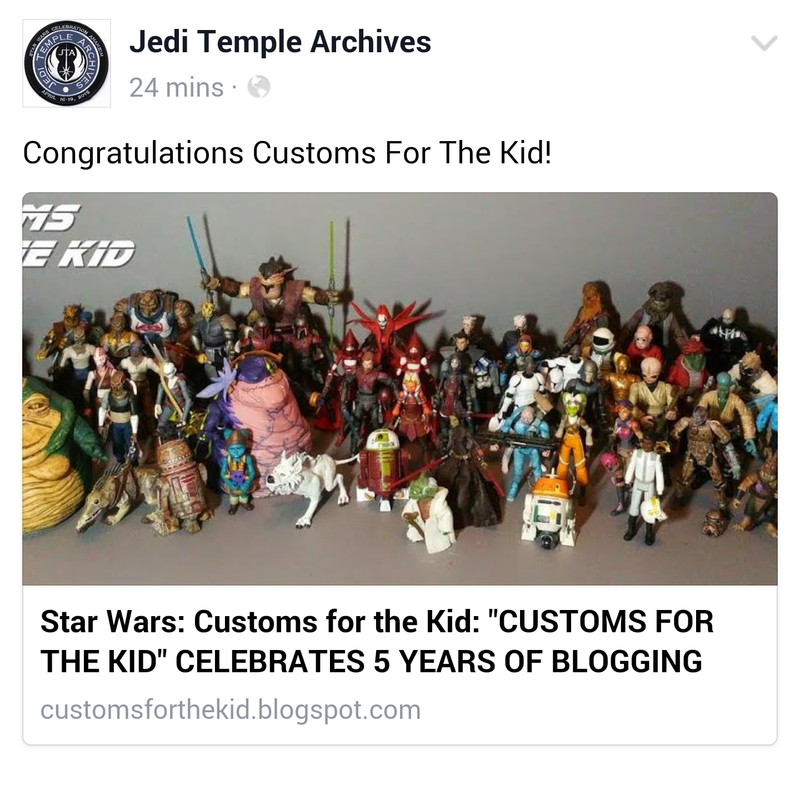 They'd also like to thank all the podcasts like RebelForce Radio, The Star Wars Underworld podcast, The Wolfpack Podcast, Custom Action Figure News, The Voice of the Republic podcast, SWAG77, and Expanded Fandomverse, for featuring Customs for the Kid on their programming. Thank you to all the fans who take the time write letters, leave comments on social media, and send pictures of their action figures. Your communications are inspiring. 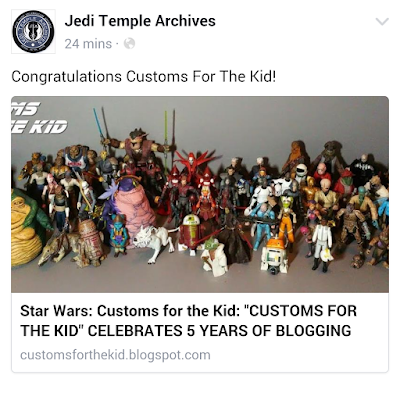 Customs for the Kid are so thankful to the Star Wars community for helping spread the word about Star Wars custom action figures and the artists that create them. Most of all, Customs for the Kid thanks the artists they feature for letting them spread their art to all the corners of the world. Without their contributions no one who visits their blog would have any reason to come. 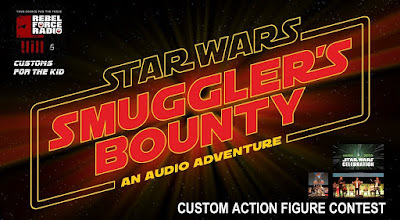 Enter the current "Star Wars: Smuggler's Bounty" custom action figure contest that they are holding with RebelForce Radio! After the success of the contest they did for "Star Wars: Smuggler's Gambit", they definitely wanted to continue the fun with Kyle Newman and F.J. DeSanto's latest audio adventure. This is where you can find a full picture listing of all the action figures Customs for the Kid have made over the years. They tried to organize them in a way that you can locate the custom action figure by their associated film and when the figure is not associated with a film, they grouped them into either Expanded Universe or Fan Fiction. 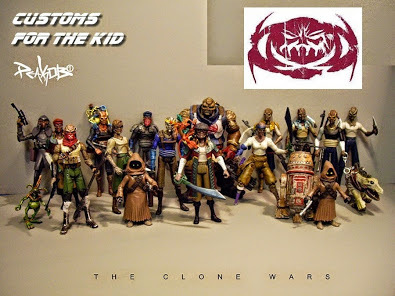 This is where you can view pieces from the personal collection of Star Wars custom action figures made by other talented members in the custom action figure community. They also provide links to see more of these artist's work than featured here, and best of all, provide you ways to obtain the artist's work if they have any for sale. 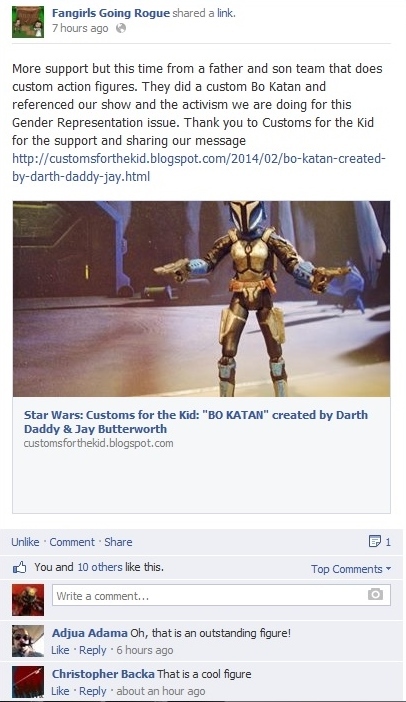 For the last several years, Customs for the Kid has been slowly creating an action figure artist directory featuring video slideshows of each artist's work and even more importantly, information about where you can follow or purchase their Star Wars custom action figure art. If anybody were to ask what customizers influence them when they create a new action figure, these artists would be a great start. Most of these pieces are not in their collection. This is a great place to find awesome custom action figure artists that they can't showcase in their Customizer's Spotlight archive, because sadly, their work hasn't found their way into their collection yet. Believe me, it isn't because they wouldn't want these incredible action figures. They provide links to see more of these artist's work here too, and yes, they make sure they provide you with contact information to obtain these customs if they have any for sale. These are the most talented Star Wars custom artists out there today! A few times Customs for the Kid have been asked if they were only customizers or were they Star Wars toy collectors too. Here are some of the pictures from the Customs for the Kid collection. Only about a third of the collection is on display so far. They are always documenting more as they go. Wish they made more female Star Wars action figures? They feel you. They know there are a lot of fangirls out there just waiting for a stronger female presence in the Star Wars action figure line. They like a more balanced Star Wars action figure collection in their house. Let's be honest, Star Wars is for everyone. Am I right? Check out these custom Star Wars action figures made with all the Fangirls in mind. Female action figures need equal footing when it comes to the Star Wars toy line. How do we order customs. Because I would order something.